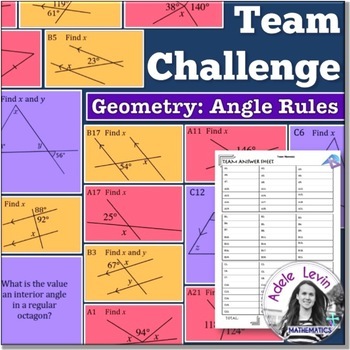 These task cards are designed to get students practicing a variety of problems involving ANGLE RULES in a fun, competitive, collaborative and differentiated environment. Students apply their angle knowledge to a range of problems including angles on a straight line, in a triangle, around point, with a transversal of parallel lines and other polygon angles facts. Not sure what a TEAM CHALLENGE is like? 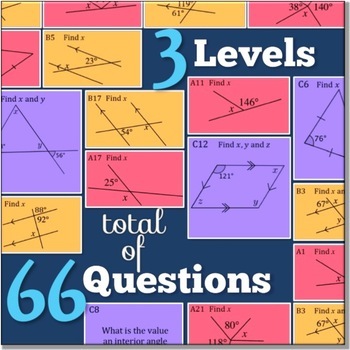 Level C (24 cards) – harder problems solving with angles. Skills include the ones needed for cards A & B as well as rules for angles in polygons, interior and exterior angles. 2. Student Response Sheets - for students to write all their answers on. 3. Teacher Solutions - a version of the Student Response Sheets with all the solutions. These cards are so versatile they could be used in so many different ways: team challenges, worksheets, relays, teamwork to suggest just a few! TEAM CHALLENGES are a great way to get students practicing core skills in a competitive and differentiated environment. Ideal for mixed ability classes, or to review skills at the end of a topic.